A senior IT consultant sharing news and knowledge on the latest technologies for Small Businesses. One of my users recently started having a problem with receiving duplicate text (or SMS) messages on his Blackberry. This would happen to the majority of messages he received, but not all of them. And some would only have one duplicate message but others might eventually have 5 or 6 copies of the same message. Sometimes the duplicates would show up with different dates as well. I think something was corrupt with the text message database on his phone so I wanted to wipe out all text messages and see what happened. So I connected his Blackberry to my laptop running the Blackberry Desktop Software and made a full backup of the phone. Then in Blackberry Desktop I went to Device -> Delete Data and selected both "Text" and "SMS" entries just to be sure. "Cannot sign in to Lync. There was a problem acquiring a personal certificate required to sign in". Of course I tried all of the typical stuff - restarting Lync, rebooting the laptop but it didn't help. No other users were reporting this issue - they could all sign in just fine - so I'm assuming it's something local to my Windows 7 64 bit laptop. Open Windows Certificate Manager. To do this, click Start, click Run, type certmgr.msc, and then click OK. Expand Personal, and then expand Certificates. Sort by the Issued By column, and then look for a certificate that is issued by Communications Server. Verify that the certificate is present and that it is not expired. Delete the certificate and try to sign in to Lync Online. If you cannot sign in to Lync Online, go to step 2. Click Start, click Control Panel, and then click Credential Manager. 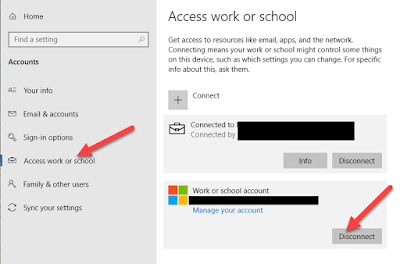 Locate the set of credentials that is used to connect to Lync Online. Expand the set of credentials, and then select Remove from Vault. Try to sign in to Lync Online again, and then type your new set of credentials. Office 365 - Can't Display Online Services - Sorry we had a server issue and can't display your connected services. Please try again. Check mailbox size and usage with Office 365 or Exchange online. Find users nearing their quota. I'm a senior IT consultant focusing on small business technology support and solutions - Microsoft Office 365 (Cloud hosted Exchange, Lync and SharePoint), Microsoft servers and desktops, remote access, mobile devices (iPhone, Android, Blackberry), backups, etc. I work with clients in the Baltimore, MD area. Please feel free to email me if I can be of assistance!